2016 – Phase I data NBTXR3 Soft Tissue Sarcoma – Bonvalot et al. 2014 – NBTXR3 concept and dose enhancement – Marill et al. 2012 – Efficacy of NBTXR3 in vitro and in vivo – Maggiorella et al. 2010 – Concept of NBTXR3 – Borghi et al. 2015 – Metals as radio-enhancers in oncology – Pottier et al. 2015 – The future of nanosized radiation enhancers – Pottier et al. 2014 – Metals as Nanosized Radioenhancers – Pottier et al. 2017 – Nano-sized cytochrome p450 3a4 inhibitors to block hepatic – Paolini et al. 2017 – A new opportunity for nanomedicines – Paolini et al. 2010 – Nanocarrier for Photodynamic Therapy – Thienot et al. 2010 – Silica Nanoparticles – Simon et al. 2010 – Combinations of proteins with Nano-Systems – Di Marco et al. 2014 – ASCO Abstract – Preliminary Data NBTXR3 Soft Tissue Sarcoma – Bonvalot et al. 2011 – ECCO Abstract – NBTXR3 as promising cancer therapy – Magiorella et al. 2011 – AACR Abstract – NBTXR3 radioenhancement and anti-tumor effect in vitro – Magiorella et al. 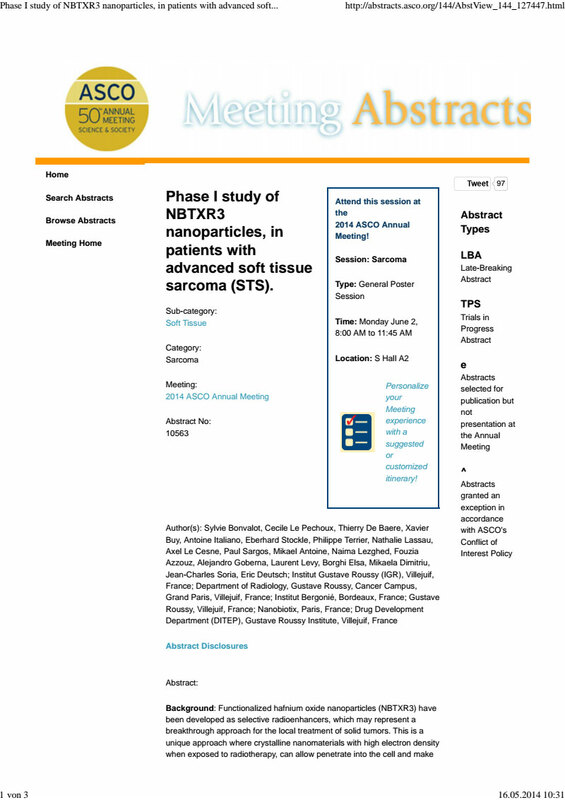 2010 – ESTRO Abstract – hafnium Oxide nanoparticles as anti cancer agent – Deutsch et al. 2015 – Clinical Sciences and Drug Discovery Abstract – Use of metals as nano-sized radiation enhancers – Pottier et al. 2011 – CLINAM Abstract – Thermosensitive Magnetoliposomes for MRI-Guided Drug Delivery – Meyr et al. 2010 – GDR Photomed Abstract – Silica Nanoparticles for Photodynamic Therapy – Thienot et al. 2010 – CLINAM Abstract – Expected and Unexpected Side Effects of Nanodrugs – Levy et al. ASCO · 2014, Bonvalot S. et al. Nano Publications > Congress Abstracts > Clinical Data NBTXR3 > 2014 – ASCO Abstract – Preliminary Data NBTXR3 Soft Tissue Sarcoma – Bonvalot et al. Background: Functionalized hafnium oxide nanoparticles (NBTXR3) have been developed as selective radioenhancers, which may represent a breakthrough approach for the local treatment of solid tumors. This is a unique approach where crystalline nanomaterials with high electron density when exposed to radiotherapy, can allow penetrate into the cell and make feasible the absorption/deposition of a high energy dose within the tumor cell. A phase I/II trial was implemented in patients with locally advanced STS. Methods: Patientsreceived a single intratumor (IT) injection of NBTXR3, volume escalated, followed by 50Gy RTx. Primary endpoints include feasibility of the IT implantation and safety. Secondary endpoints focus on efficacy such as pathological and RECIST response, IT residency of NBTXR3 over all the RTx period and operability. Results: Enrollment was completed for volume 1, 2, and 3 (15 pts). Feasibility of the IT injection was confirmed. The treatment was safe with no SAE, no early DLT and allowed the pts for completion of the planned RTx schedule. No grade 3-4 toxicity occurred, main grade 1-2 toxicities related to NBTXR3 were injection pain/reaction (4 pts), pyrexia (2 pts), abdominal pain (1 pt), pruritus (1 pt) and paresthesia (1 pt). Results demonstrated that a single injection of NBTXR3 provides adequate bioavailability of NBTXR3 IT over five weeks of radiotherapy. No leakage of NBTXR3 to the adjoining healthy tissues was observed. Further, NBTXR3 persistence was established by CT scan before surgery. Conclusions: Injection of NBTXR3 was well tolerated. All pts received the planned radiotherapy (50 Gy/25 fractions/ 5 weeks) followed by wide surgical resection of the sarcoma. NBTXR3 with RTx showed a very good safety profile. Encouraging signs of antitumor activity were observed in different sarcoma subtypes, such as undifferentiated sarcoma, rhabdomyosarcoma, and synovial sarcoma, which constitutes a promising feature for this subset of pts whose primary tumor is locally advanced and has an important risk of relapse. Clinical trial information: NCT01433068. The cookie settings on this website are set to “allow cookies” to give you the possibility to switch between languages in a way that this will not interfere with page navigation. If you continue to use this website without changing your cookie settings or you click “Accept” below then you are consenting to this.Par défaut, les paramètres de ce site autorisent les cookies pour vous permettre notamment de naviguer entre les différentes langues disponibles. Nous utilisons des cookies pour vous proposer un site internet facile d'utilisation, sécurisé et fonctionnel. Si vous les autorisez également, cliquez sur « Accepter » ou poursuivez simplement votre navigation.